My mad love of beauty oils extends to oils specifically intended for use on the hair and scalp, and as a person with naturally curly hair, nourishing high quality oils have long been among my most coveted haircare essentials. 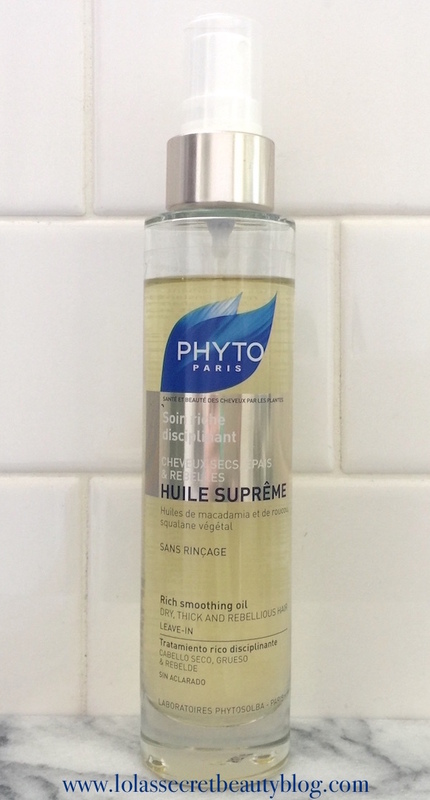 PHYTO PARIS Huile Suprême Rich Smoothing Oil is a rich oil that deeply nourishes dry hair, tames frizz and fly-aways, and leaves hair ultra-manageable, soft and shiny. It can be applied to wet or dry hair, and works beautifully whether used before blow frying or air drying. If you have curly hair, as I do, Huile Suprême defines curls to perfection. It has a light and pleasant scent, but it dissipates soon after application. Huile Suprême Rich Smoothing Oil is Silicone-free, Paraben-free, sulfate-free and Phthalates-free. 99% botanical formula. Huile Supreme is a rich, beautifying treatment oil that instantly absorbs into the hair while delivering deep down nutrition. The versatile formula can be used prior to blow drying or as a finishing touch to discipline thick and rebellious hair. Just a few drops creates perfectly defined curls and reduces excess volume. 99% natural, silicone-free formula will turn the most unruly hair into healthier, smoother, shinier, more manageable tresses. How to use: Start with one pump and rub between hands. Apply more if needed. Distribute evenly concentrating on mid-shafts and ends. • Pre-Blow dry: Apply to towel-dried hair, comb through and blow dry as normal for additional protection. •Finishing:Work into the ends of the hair to control frizz, smooth and style. •Touch-up:Apply a drop to ends throughout the day for a touch of shine as needed. Creates beautiful, perfectly defined curls and reduces excess volume. Do not overuse. Ingredients: Coco-Caprylate, Zea Mays (Corn) Germ Oil, Isopropyl Myristate, Alcohol Denat, Squalane, Helianthus Annuus (Sunflower) Seed Oil, Fragrance, Macadamia Ternifolia Seed Oil, Glycine Soja (Soybean) Lipids, Bixa Orellana Seed Extract, Hypericum Perforatum Flower Extract, Salix Alba (Willow) Leaf Extract, Althaea Officinalis Root Extract, Arctium Lappa Root Extract, Rosmarinus Officinalis (Rosemary) Leaf Extract, Salvia Officinalis (Sage) Leaf Extract, Calendula Officinalis Flower Extract, Caprylic/Capric Triglyceride, Limonene, Linalool, Coumarin, Geraniol, Tocopherol, Botanical and natural origin. Overall Assessment: I love that this is a silicone-free hair oil. and it works so well that it is my most reached-for hair oil. I will definitely buy a replacement bottle as soon as I finish this one. $40.00 for 3.4 oz. from Phyto, Nordstrom, Sephora, Beauty.com and John Lewis (£26.50) (Affiliate Links). I think this would be great for my hair, especially as a finish on already styled hair. Thanks for the review! You are very welcome, Stacie. It is my most reached-for hair oil these days! It's lightweight and super effective! It's definitely worth checking out if you are in the market for a hair oil! This one is definitely a winner! I am so happy with it! If this is as good as the other Phyto I've used then it has to be awesome. It's definitely one of my very favorite Phyto products, and it's definitely worth checking out if you seek a nourishing hair oil that doesn't weigh down the hair! Hair oils are a no no for me, but I do like Phyto as a brand. It's definitely a really great hair oil, but no need in trying it if you can't use hair oils. Phyto does, indeed, make some really amazing products! I love Phyto's deep conditioning products. As a rule, hair oils give me a stiff neck but this sounds nice and lightweight. Their deep conditioning products are excellent, I agree! How do they give you a stiff neck? This sounds like it would be good for my hair. It's a super nourishing oil, and it doesn't weigh down hair! I think tha tyou would really like it, Courtney! While it's not quite right for my hair type, it sounds great. I loved everything I've tried from Phyto. Phyto is definitely a fantastic line, but if hair oils don't work for you, then I would definitely skip this! I've been loving hair oils lately, especially for my dry ends. This one sounds like a good one to try! I can't do hair oils in the Summer but in the Fall/Winter I use em up quick! If you use them in the Fall/Winter, then you should definitely add this one to your list– I think that you would love it!